*Suggested ordering schedule based on 3 meals per week. 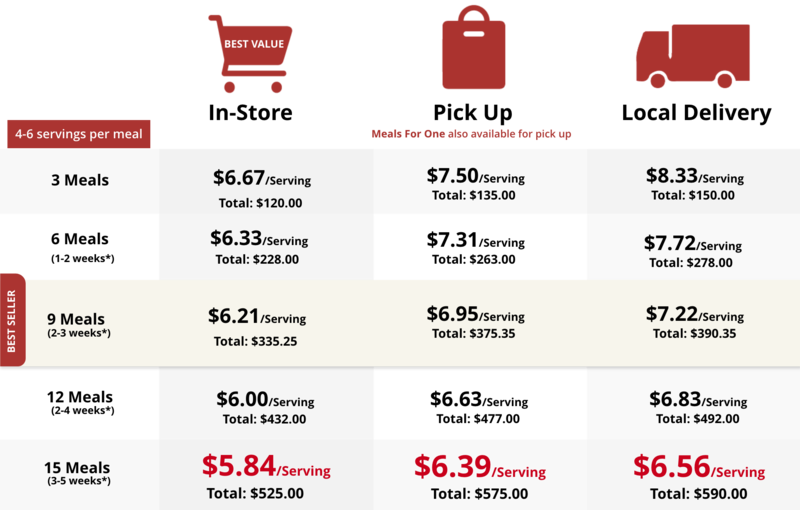 Split-meals available at an additional cost. Wide selection of single-serving meals | Freshly prepared in-store | No need to pre-order, just stop by and pick up. Wide selection of single-serving meals. Freshly prepared in-store. No need to pre-order, just stop by and pick up. Complete your meal with one of our pre-assembled side dishes. Homemade desserts that can be added to your order online or in-store. Split meals available for smaller families. If you need to cancel your in-store visit, please call us immediately. Cancellations with at least 4 days notice can be rescheduled or refunded. With less than 4 days notice, we cannot provide a refund or reschedule but are happy to prepare your meals for pick up (additional fees apply).